Domain name registration is essential if you want to run your own website or blog using your own domain name. If you use WordPress.com or Blogger (you may use custom domain with blogger), then this is not required, but those with self-hosted blogs must register a domain name for the site. Domain names are used to identify websites, otherwise your web address would be in the form of a very user-unfriendly sequence of numbers. You can decide on your own domain name, but each must be registered through the Domain Name Service (DNS) and each must be unique. You cannot have two websites or blogs with exactly the same web address, which is why using a domain name generator makes sense if you’re brainstorming good domain ideas. Here is more information on domain names, how to select them and how to register them. Let’s get one thing straight right now – you will never own a domain name: you lease it. When you register a domain name, you can do so for any period of time from one year to 10 years. Irrespective of this, as long as you continue to renew your registration when it becomes due – this time next year or in 10 years time – you can keep it forever. Although you can sell it on the open market, nobody can take your domain name away from you unless you fail to renew it – and even then you have a period of grace to allow you to make up for your memory loss! However, if you do lose it then you are likely to find somebody else using it, and you will certainly find that your visitors will get a 404 error message when they try to click to your site. So always keep your domain payments up to date – set up a regular automatic payment agreement so that it is auto-renewed each year. You can choose any name and Top Level Domain (TLD: .com, .info, .org, .net etc) combination you want, but it must be unique. The effective minimum number of characters for a domain name is now 3 before the dot. For example, abc.com or 1AA.org – you can use numbers and letters up to a maximum of 63 characters. Forget these, however, since virtually all three-letter domains have been taken up. There was a time when you could register 1 and 2-character domain names, but these are no longer available. It helps if you can find a domain name available that is related to your niche or even to the name of your business. Google still gives ranking weighting to exact match domain names, where the name of the name is also the business name. There has been talk of this policy being dropped, but so far Google has taken no action. In fact, the Penguin algorithm update has made it even more useful to match your website or blog name and your domain name. That is because Penguin 1 and 2 punish over-use of keyword-rich anchor text. A large proportion of the anchor text you use in links should now relate to the business name or domain name. It therefore helps if these are the same. Thus, if you sell red widgets, then Red-Widgets.com is a good domain name for a business named Red Widgets. Your domain, business name and anchor text can all be the same without Google Penguin flapping its wings too hard! This is not essential, of course, but it helps. Unfortunately, such domain names have now practically all been registered for common niches. Keep it short: Short domains are better than longer ones: they are easier to type and easier to remember. Avoid Cell Phone Speak: Many people make the mistake of using cell phone abbreviations, such as Toys4U.zzz. This does not work for domain names since Google does not recognize such terms, and they are rarely used in searches. Use Google Trends: Use Google Trends to find top topics and get hints for keywords and great domain names. Avoid Copyright: Never use copyrighted terms such as eBay, Windows, and other similar wording. You will be warned to remove it and if you fail to do so, you will likely be prosecuted. So forget well known names such as this, even if they are using in common parlance. There are many different TLDs now that relate to specific countries, such as .in (India), .de (Germany), jp (Japan), and .co.uk (United Kingdom). You should use these only if your business is local to your country. It does not help to select such domain names if you want your website to be visible internationally. Search engines can now provide search engine results that relate to the geographical position of a searcher’s own IP address. If you use Google Places and its Local Search facility, then such TLDs will be of benefit to you. A local TLD will help you achieve a much higher ranking for such local results than if you had a .com top level domain. In general, a .com, .org or .net top level domain will be a better choice for international exposure. Otherwise, do not complain if all your top listings are only on your own country’s version of Google. 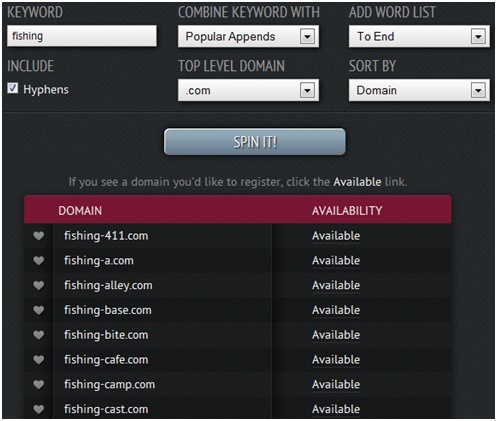 Before registering a domain name, you have to find one that is available for you to use. You could try a few that you like, but in 2014 it no longer as easily to find a good one as it once was. Most obvious names are going very rapidly. Verisign reported 11 million new domain names being registered in the final quarter of 2012. However, many are also being closed, and it makes sense to try for the best domain you can find. In saying that, it is likely going to take you a great deal of time to find a suitable address for your website or blog if you try them one at a time. You need a good tool to help you identify the available names that are relevant to your blog or website. This is just a small selection of the results returned. It tells you what domain names are available, registered and for sale. As expected the .com domains are largely gone, but you can still get the .co and .me TLDs. The former was originally intended for domains originating in Colombia, and the latter Montenegro. However, they can be used by anybody and have become popular for obvious reasons. Click on the ‘Available’ link and you get a list of domain name services to buy it from. There are many other categories of suffixes or prefixes you can use, with and without hyphens. If you see nothing that suits you, check .org then .net and so on. Alternatively, put ‘fishing’ second by adding the word list to the beginning. It’s not the “best domain name generator ever”, but it’s OK. BloggingDesk.com could be a good domain to use for your blog, and you would likely not have thought of it without this tool. The same is true for all of these tools, each of which operated in slightly different ways. Use all three together to find the best available domain name for your blog or website. Many people spend too much time trying to think of a good one, and having decided, find it to be unavailable. These three tools are among the best available to make it easier to come up with an available domain name relevant to your business or blog. Most great ideas have already been registered. 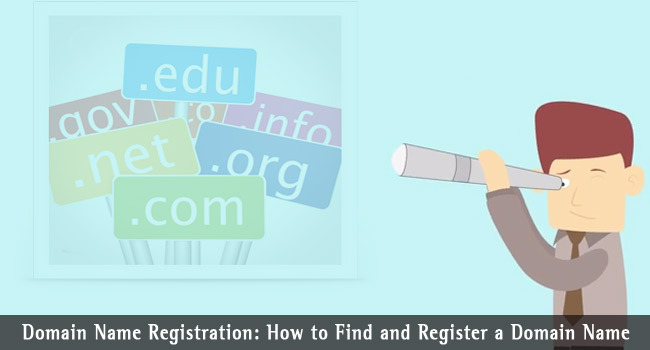 Once you have found a good domain name that nobody else has registered, what next? Here is how to register the name. There is a vast choice of website hosting services available online, and it is not our purpose here to compare them. You can do that on our blog post Web Hosting Services. However, whichever you choose, they are almost certain to offer you a domain name service. Some offer you a free domain name, at least for the first year, and others offer to register your domain name for you. There are two issues with this type of service. The first is that you do not get a free domain name. The cost is added to your hosting charges. It is perhaps not stated as such, but domain names are never free, and you never own them. As explained above, they are leased. If you pay monthly for your web hosting, your annual domain name payment will be included in the price. What you do not know is how much of the price is being charged for the domain name. Ask your web host that question and if the price stated is greater than you could get yourself, or they do not give you a price, then do it yourself. One issue with many web hosting services is that if you leave them, then you also lose your domain name. That is because it has not been registered in your name, but in theirs. Why not ask your web host to whom the domain name would be registered? Do this before agreeing to them provide it, because you are not obliged to agree to this. You are perfectly entitled to use your own domain name for your account. As stated above, you can register your domain name with any registration service of your choice if you prefer to do so. If your web host refuses this, then find another that does. This will not take you long, because all reputable web hosting services permit you to provide your own domain name and point it to your new web host via the DNS system. Assuming that you elect to register your domain name yourself you must then find a domain name registration service that does not also require you to sign up for their web hosting service. There are many of these, including Namecheap, NameServe, Name, GoDaddy, 1and1, Network Solutions and Moniker among others. In fact, the majority of web hosts use one of these to register the domain name in their own name and lease it to you, so that if you decide to leave them you may also lose your domain name and hence your website. 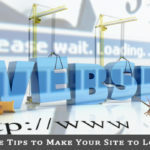 As stated earlier, it is generally best not to create this connection between your domain name and your web hosting service. You can come across great difficulties if you decide to change hosts. That is one reason why so many people prefer to register their own domain name rather than do so through their hosting service. Keep in mind that you do not own the domain name, the registrar does, and that registrar can take it from you and offer it on the open market if their Terms and Conditions state this. So check out your registrar and its Terms of Service carefully. There will likely not be a great deal of difference between them all. Make sure that the domain will be registered in your name, and not in that of the registrar or any web hosting service. You can register your domain for one year upwards, but you are best to do so initially for one year with any new registrar. You don’t want to be stuck with the same registrar for 5 years if you find a reason to change. We shall first explain the main factors to consider when selecting a registration service, and then provide a quick review of the more popular registration services available today. ICANN Accreditation: Make sure your registrar is accredited by the ICANN (Internet Corporation for Assigned Names and Numbers) and that it not only maintains its annual fees to that body, but also to Network Solutions which maintains the central domain name register. Check the TOS of your domain name registration company, and make yourself fully aware of the conditions under which it can take the domain from you. Such services tend to differ in this respect, so if you are unhappy with the TOS of your choice, then seek another from the list below. In saying that, the vast majority of people have no problems with their domain – they only tend to arise when they are late with their annual renewal payment. Registration period: If your domain name becomes a popular one, never fall even a day behind with your payments! This could cause the total collapse of a successful online business. If your website or blog becomes successful, and you are happy with your registrar, then register your domain name for as long a period as you can afford. Popularity: If you choose one of the more popular services then you can hardly go wrong. There are domain name scammers around who will take your money then disappear. If you choose one of the options below, then you are unlikely to go wrong. Here is a selection of domain name registration services that will allow you to pay for a name without you also having to use their hosting service. If you read online reviews you will always find people that have had bad experiences with any service. 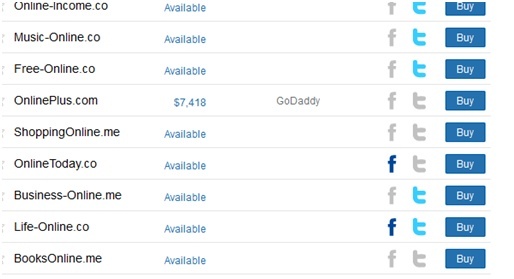 GoDaddy seems to get more of these than any other, but perhaps that is because GoDaddy is the world’s largest domain name registration service with most users. It also gets lots of rave reviews and lots of negative reviews. Quite frankly, if you use any of the following five, you may have good and bad experiences over time. These are presented in alphabetical order, not in any order of preference. GoDaddy is the world’s largest domain name registration service. It offers domain names with over 100 different TLD suffices including all the popular ones and also those related geographically to your country of business. GoDaddy also offers web hosting, although it is not necessary to take this if all you want to do is register a domain name. The way it pushes its upsells, however, can be distracting and a complete nuisance. Like most other registration companies, GoDaddy does not offer much in the way of help in choosing a domain name. However, although its prices are competitive GoGaddy is not always the cheapest, and if all you want is to register a name then you can get lower prices elsewhere. Its website is not the best, and prices tend to be set as ‘special deals’ that can sometimes result in a shock when the correct price is applied at renewal. Name.com offers a slightly easier interface than GoDaddy, though not as simple as those below. Domains are just as competitive priced, and you can synchronize all your domain expiration dates if you wish. This can be very handy for those with multiple domains, and don’t want the hassle of checking up on which are ready for renewal. It would appear easier, however, just to set up autorenewal for them all! Ultimately, Name is as good a domain name registration service as most others. As the name suggests, Namecheap offers domain names at low prices, yet its level of service is highly professional. Those that have used it cry its praises, and many that previously used popular service such as GoDaddy and then gave Namecheap a try, will now use no other. Keep in mind that this refers to the domain name service and not to the company’s web hosting service. The only genuine issue with Namecheap is that, in association with Domain Agents, it enables you to make an offer for a specific domain name, whether that is for sale or not. You are charged $39.95 for this, even though you have very little hope of anybody selling their business domain to you! If you fail, you get a credit for another offer – but not your money back. Avoid this way of trying to find a domain name to suit your business. NameSilo is a relatively new domain name registrar, but is already getting good reviews. It offers low pricing without the need for coupons and also excellent security. Included in that is free Whois privacy and security notification. Its support service is excellent, and the site is very easy to use. Domain name management is made very easy by NameSilo’s excellent user interface – slightly better than that of Namecheap, and anything would be better than GoDaddy’s! It is very easy to transfer domains, and DNS propagation is extremely fast – frequently a lot less than an hour when 24 hours+ is not unusual. Although this is just one opinion, we would put Namecheap at #1, with Name and NameSilo equal second. There are many others you might consider, and just like web hosting services, your opinion of domain name registration services will depend upon your own experiences with each and upon your specific requirements. Some may find GoDaddy to meet all their needs, while others will prefer Namecheap. Once you have decided on a domain name and have paid at least your first year lease on it, it must then be pointed to your web hosting service. Each registered domain name must be connected to a specific IP address. This enables people to use your domain name to reach your website. The IP address is like using your phone number to contact you. 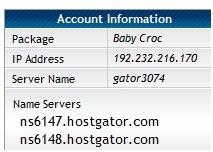 When your domain name is connected to an IP address via the DNS server or nameserver system, website names are related to IP addresses. Enter the Nameservers provided by your web hosting service as shown above – usually there will be only the two Name Severs provided, but if you are provided with four then enter all four. If not, then leave the last two blank on the form. Click ‘Submit’ and within 24-48 hours you will be able to access your website by entering its URL into your browser. It is not difficult to register a domain name. The trick lies in finding the best name appropriate for your blog or website. Domain name spinners can be used to help you with this. Once you have found an available name with your preferred TLD, you should register it independently of your web hosting service – do not tie the two together unless you are a beginner and want a free domain first with which to test and learn. There are several domain name registration services available online, but this is too important a decision to leave to chance. Before you finally register a domain name, check out your choices with online review sites and then take that important leap. It will probably be one of the most important decisions you make in connection with your blog or online business. Strangely, it is also one of the least considered by many people unaware of its importance. 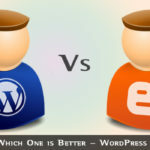 WordPress Vs Blogger – Wondering Which One is Better? WordPress Vs Joomla Vs Drupal Which One is Best and Why? Hi Rajesh! Thank you for such great content! I just like to add a quick tip to the audience if they are looking for new domain names. I have seen many blogs that try to add as many keywords in their domain names, which is really bad. The best practice for a blogger is to have one keyword + branded word so their blog can be more authentic. Even better, if you are looking to grow your blog into a business, you may drop the keyword and keep only the brand. This will help you in the long run. Thanks again Rajesh!